Are you tired of high electric bills? Who isn’t? Well, those with solar power have another story to tell. In fact, one of our green colleagues just announced his electric bill for his California home came in this month at a whopping .95 cents! Yes, less than the price of a cup of coffee! Think about what this extra savings every month could mean for you and your family. When we think of greening our homes and embracing energy efficiency, the first thing that comes to mind for many is saving the planet. But, before images of Birkenstock shoes, dreadlocks and sleeping in tents flashes through your mind – consider this. Today, going green means maintaining all of the comforts of your home, saving money, while also doing your part to help Mother Earth. In this SolarCity Energy Efficiency Sweepstakes, one lucky homeowner (eligible states include: CA, AZ, CO, OR, MD, DC, NJ, NY, MA, CT) will win a FREE Home Energy Evaluation. Earth Day (April 22nd) may be behind us, but now you can make everyday Earth Day! Wouldn’t it be great to have experts evaluate your home and diagnose the causes of your high utility bills or discomfort by analyzing how your home uses—and loses—energy? They’ll even assess potential savings and availability of rebates and other incentives that you may be eligible for. Watch a Home Energy Evaluation HERE. 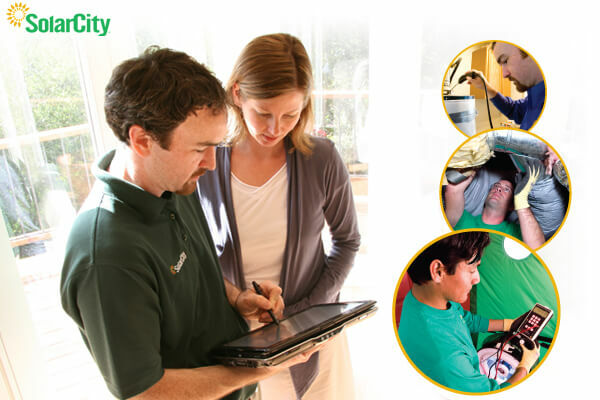 SolarCity’s energy professionals use specialized instruments to thoroughly test and measure household appliances, heating and cooling systems and building construction. They’ll enter this data into their proprietary software tool to holistically assess energy consumption. For every action below that you complete, you’ll earn entries into the sweepstakes. Click each individual action to enter yourself. For actions you have done in the past (i.e. you already follow @SolarCity or @RonandLisa on Twitter) just click directly on ‘I did this’. The eligibility of the winner will be verified by SolarCity. You may tweet or share on Google+ or your Facebook wall for an entry once per day. All other actions will only be counted once. Contest ends 6/1/12 at 12:01 ET. Open to US residents who reside in the following states: CA, AZ, CO, OR, MD, DC, NJ, NY, MA and CT. Click here for complete terms and conditions. Solar is very interesting topic. Great – good luck Marthalynn!